Home / Announcements / Azure Cost Management now general availability for enterprise agreements and more! As enterprises accelerate cloud adoption, it is becoming increasingly important to manage cloud costs across the organization. Last September, we announced the public preview of a comprehensive native cost management solution for enterprise customers. 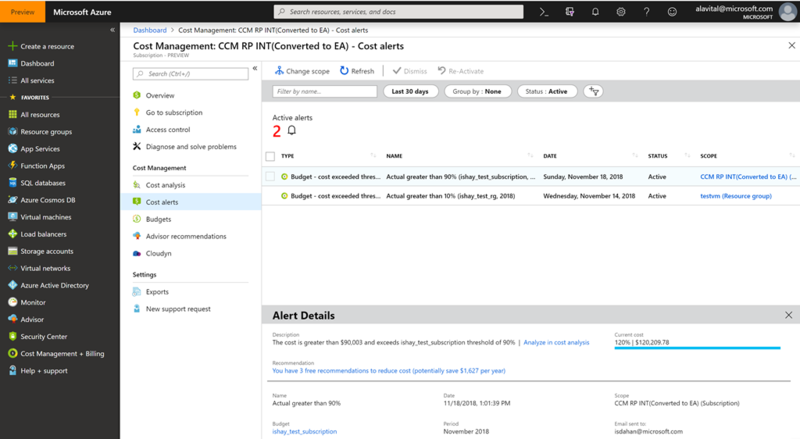 We are now excited to announce the general availability (GA) of Azure Cost Management experience that helps organizations visualize, manage, and optimize costs across Azure. In addition, we are excited to announce the public preview for web direct Pay-As-You-Go customers and Azure Government cloud. As a part of this release we are also making the APIs mentioned below available for you to build your own cost management solutions. To learn more about developing on top of our new cost management functionality, please visit the Azure REST API documentation links below. Usage Query – Develop advanced API query calls to learn the most about your organization’s usage and cost patterns. 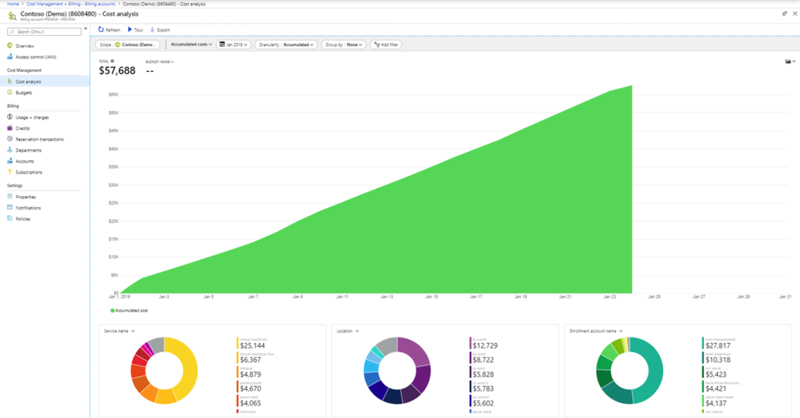 Budgets – Create and view your budgets in an automated fashion. 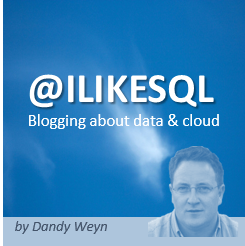 Exports – Automate data export configuration. Usage details by Management Group – Use this API to analyze your organization’s usage across multiple subscriptions. View and manage all your alerts in one single place with the new alerts preview feature. In the release you can view budget alerts, monetary commitment alerts, and department spending quota alerts. You can also view active and dismissed alerts. Get started now on this end-to-end cost management and optimization solution that enables you to get the most value for every cloud dollar spent. Please visit the Azure Cost Management documentation page for tutorial and details on getting started. We will continue to iterate additional Cost Management features, so can enjoy a more unified user experience with features like ability to save and schedule reports, additional capabilities in cost analysis, budgets, alerts, and exports, as well as show backs in the coming months. Partners will also soon be able to leverage the benefits of cost management with our support for the Cloud Solution Provider (CSP) program. With Azure Cost Management, Microsoft is committed to continuing the investment in supporting a multi-cloud environment including Azure and AWS. Public preview for AWS is currently targeted for Q2 of the current calendar year. We plan continue to enhance this with support for other clouds in the near future. Are you ready for the best part? Azure Cost Management is available for free to all customers and partners to manage Azure costs. The Cloudyn portal will continue to be available to customers while we integrate all relevant functionality into native Azure Cost Management. Follow us on Twitter @AzureCostMgmt for exciting cost management updates.